I like a good sale or a discount. How about you? It is even better when we earn extra cash – cash for that special gift for a loved one or a vacation for the whole family. When I got an immediate 24% discount and earned some cash while using with the Young Living pure essential oils – I immediately got excited and shared with more people. The more people I helped – the more fulfilled I became. I have the best time watching as people use the oils and seeing the look on their faces – when they smell or apply the oils! 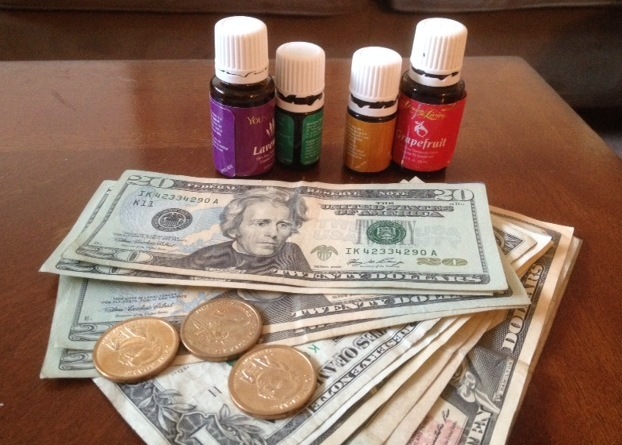 Many of you have asked how to get a discount or earn cash with essential oils. Today I’m going to show you how. It is my mission to help and share with more people this year. The state of our health care system has caused me to think about the need to take care of our health and show others how to do the same. Are you ready for your new adventure? Are you ready to achieve your financial goals this year? I’m here to take you by the hand and journey with you and pursue your dreams with gusto! First, let’s get the 24% discount. Why pay retail when you can be your own boss, pay wholesale and share with a friend and another friend – ultimately getting paid referral fees by telling the good health news to others who need it! To get started, order your Premium Starter Kit. Read my article, How to Get your Oils for the First Time for step by step information. Start by ordering Premium Starter Kit. Either get started with the 100 PV Essential Reward Program immediately or at a later time. You must commit to 100 PV. It is easy to reach 100 PV if you are transforming your health and home. Or if you can’t reach the 100 PV, just purchase a few popular essential oils like Lavender, Peppermint or Thieves – sell it retail to friends or colleagues who need them immediately. I know a gal who did that and made some extra money. Earning money takes work. It is fun when you are doing something you love, have your own schedule and help others at the same time. 1. Join my private Facebook group and get coaching, tips, encouraging words, meet like-minded friends, enter for monthly drawings. 2. Ask any urgent pressing questions regarding your health, family and friend’s health needs, business help and more. 4. My time and expertise – it is my intention to help you succeed when you join my team. No one should be left to figure things out. My team and I will take you by the hand and walk you through the process if you are willing to put in time into your essential oil business. 5. The ability to set up a home-based business and get some tax benefits (I am not a tax accountant. Every individual situation is different. Check with your accountant on the benefits of setting up a home-based business). 6. Discounted products, reduced shipping rates, private deals from Young Living Essential Oils and more. 1. You must be willing to invest in the Premium Starter Kit (only $150) to get started. 2. Must commit to 100 PV Essential Rewards Points. It is a business and a business needs money to run. I have two offices and they cost more to run than the Premium Starter Kit and Essential Rewards. 3. You must be willing to put in at least five hours of your time each week (that’s like watching two movies) to work your business by sharing your story with essential oils. 4. Most of all, you must have a huge goal- why you want to earn cash with essential oils. I have a few leadership positions in the next three months. Want to work with me? Email me sgwallace@yadtel.net and let’s get started. Note: Interested to use the essential oils but don’t want to work the business? No problem. Go to How to Get your Oils for the First Time and get your oils today. Next post: What? You didn’t get Flowers?! Previous post: The VERY First Time!